In terms of performance the HW80k was a completely different class of air rifle to the Crosman Ratcatcher. I'd been doing target practise at 30 yards on a half-inch-thick piece of damp chipboard with the Ratcatcher. From that distance, the .22 pellets would gather in a fairly tight group around the bullseye, penetrate the card of the target and embed themselves to a depth of about half their length in the surface of the chipboard beneath. 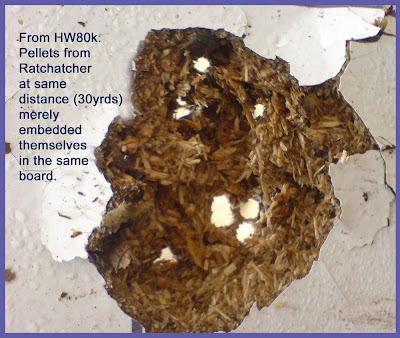 I fired the HW80k at a target on the same panel of chipboard and when I took it off to see how the pellets had fared I saw to my surprise that this group of pellets had not embedded themselves at all - they had instead blasted clear through the board. The difference between 7ftlbs and 12ftlbs could not have been more clear. I hadn't given a thought to recoil when using the Ratcatcher - it didn't really have any. But the absence of recoil on the Ratty only really became clear to me retrospectively when I'd fired the Weihrauch - because this gun had recoil a-plenty. It was quite a shock at first; when I squeezed the trigger on the Ratty I'd be bracing myself for a recoil which never really came; with the Weihrauch, however, I did give out a genuine yelp of surprise when the thing went off the first time: it really did have a kick. But not only did it kick, it was heavy. The Ratty weighed nothing - but this thing weighed a ton: nearly eleven pounds, all told, with scope and sound moderator. Standing, if I took more than a couple of breaths to stabilise the waving of the gun while I aimed, I found that I'd start to wobble again at the sheer effort of keeping the thing horizontal. Learning to fire a springer, so I had read, took some time - and I could see why. I was, at first, overwhelmed by the size, weight, and recoil of the gun. But beyond this, after I'd done some more target practise, I also began to suspect that the recoil itself was not as well-behaved as it might have been. I began to notice that when I fired the rifle - in addition to a recoil along the axis of the direction in which it was pointing there was a discernible side-to-side recoil as well. I began to look around on the net for information about tuning air rifles - and of course, there's a stack of it. A lot of it is devoted to techniques for home-tuning and the merits and demerits of the various tuning kits, lubricants, springs, spring hats and guides - seemingly endless - that you can buy and then apply yourself. The rest of the material on home tuning - at least in the U.K - is devoted to stern warnings concerning the length of time that you can expect to stay in prison if your home-improved rifle ends up straying a whit above the 12ftlb mark (five years!). Stuff all this, I thought, I'll just have to pay someone to tune it for me. I looked around a bit and eventually took it to Sandwell Field Sports in Birmingham. Tony Wall there agreed to give the gun a "First Stage Tuning" for me for which would cost £60 and take a week. When I went to get the gun (and after I'd finished the coffee and biscuits that always seem to be on offer at the shop) I spoke to Tony about maintenance, "What do I need to do in terms of oil and stuff?" I asked him. "Nothing," he said, "Absolutely nothing. Just leave it alone, it doesn't need a thing." The tuned rifle was was simply transformed. The very noticeable boing! of the spring and wobble when fired had completely disappeared. It was replaced with a businesslike thock! and a recoil which was at once more discrete but also more positive - which is to say completely along the axis of the gun's orientation and without a trace of the old side-to-side wobble. Once scoped up and zero'd in, a practise batch of pellets through the newly-tuned rifle delivered the tightest groups I'd ever fired. My first foray into the field that evening gave me a rabbit - my first - on the very first shot. WOW WHOD HAVE THOUGHT IT. THE HW80 IS ALMOST TWICE THE POWER.